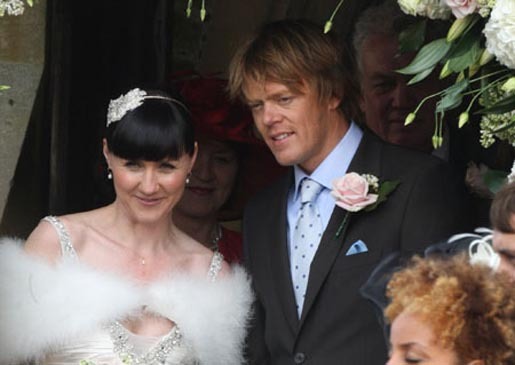 British telco BT is broadcasting the “2nd biggest wedding of the year” on April 23, bringing together Adam and Jane, the screen couple played by Kris Marshall and Esther Hall. Momentum for the next phase of the ongoing television advertising drama has been fostered with an online campaign at BT Life and Facebook in which fans voted on the bride’s dress, the wedding car and music for the first wedding dance. The campaign began in 2005, with Adam meeting single mother Jane in a lift at work. The couple got engaged in 2009 but went through a rocky time with Adam taking up a dream job offer in Cornwall. BT invited members of the public to give their feedback on the campaign’s ongoing plot with a commercial, “Heart to Heart”. After viewer feedback from 1.6 million fans, BT revealed that Jane is pregnant. In the latest instalment a heavily pregnant Jane is planning the wedding when she suddenly goes into labour early. As a result, the couple don’t have time to plan their wedding. To say thank you to fans of the long running series, BT has selected two lucky voters at random to become wedding guests, invited on set for filming at St Peter’s Church in Hascombe, Surrey. The Adam and Jane campaign was developed at AMV BBDO, London, by copywriters Phil Martin and Mary Wear, art director Brian Campbell. Filming was shot by director Declan Lowney via HSI London with director of photography Ray Coates. Post production was done at The Mill, London. Audio post production was done at Wave Studios, London.